The Diving Pool, a collection of three novellas, is the only outstanding work of Yoko Ogawa’s which is currently available in English, which I had not yet read. Although a prolific author, very few of Ogawa’s works are available in English at present, and I can only hope that this is rectified in the near future. I find Ogawa’s fiction entirely beguiling; it is strange, chilling, surprising, and oh so memorable. This collection has been translated from the original Japanese by Stephen Snyder. The Diving Pool includes the titular story, as well as ‘Pregnancy Diary’ and ‘Dormitory’. They were originally written during 1990 and 1991, and made available in English for the first time in 2008. As with much of her other work, these stories err on the dark side of human nature. ‘Pregnancy Diary’ is written from the perspective of a young woman whose sister is pregnant. It is a ‘sinister tale of greed and repulsion’, and certainly crosses boundaries of what is acceptable. At the outset of the tale, the narrator, who appears rather self-important, wonders ‘how she broke the news [of the pregnancy] to her husband. I don’t really know what they talk about when I’m not around. In fact, I don’t really understand couples at all. They seem like some sort of inexplicable gaseous body to me – a shapeless, colorless, unintelligible thing, trapped in a laboratory beaker.’ When she goes on to describe the ultrasound photograph, Ogawa makes a fitting yet unusual comparison: ‘The night sky in the background was pure and black, so dark it made you dizzy if you stared at it too long. The rain drifted through the frame like a gentle mist, but right in the middle was a hollow area in the shape of a lima bean.’ The suspense has been built brilliantly in ‘Pregnancy Diary’, and heightens when the narrator takes such unadulterated pleasure in the pain which her sister undergoes as a result of her condition. Despite these novellas being little more than long short stories, really, we learn an awful lot about each protagonist. Their narrative voices feel authentic, and the way in which Ogawa has been able to pen three stories, all with young women at their core, but has made them so different, shows what a masterful and versatile writer she is. The first two narrators have something quite sinister at their core, which are not apparent at first. The third narrator seemed more innocent, and therefore the darker elements of the story came almost as more of a shock. It feels throughout as though Ogawa wished to lull her readers into a false sense of security with these stories. The imagery which Ogawa creates is at once startling and vivid. In ‘The Diving Pool’, for instance, the narrator begins by saying: ‘It’s always warm here. I feel as though I’ve been swallowed by a huge animal.’ There is certainly a dark edge to each of the tales, which is present at the outset and builds toward the end. Throughout, there is a focus on the minutiae of life, and how things are often far more sinister than they appear at first glance. There are no satisfying conclusions here; rather, the stories end at points of heightened tension, buzzing with unanswered questions and a lack of resolution. Regardless, The Diving Pool makes for compelling and compulsive reading, and is, I think, the most unsettling of Ogawa’s books which I have read to date. There is an almost grotesque edge to each of them, and all are taut and masterfully crafted. Collected in The Diving Pool are the best kinds of stories: ones which promise to stay with you for a long time to come. I love traditional ghost stories, but was drawn to Michelle de Kretser’s Springtime: A Ghost Story precisely because it sounded unexpected. I am used to cold, dark, usually Western European settings in ghost stories, where atmosphere is built, and the sinister creeps into the scenes which we expect. De Kretser’s novel, instead, is set during the springtime in Sydney, Australia. Despite the quite low rating which the book has on Goodreads, I was intrigued by the story in Springtime, and enjoyed her novel The Rose Garden when I read it some years ago. I therefore ordered a copy immediately. Springtime is a neat little hardback, and coming in at just 85 pages, it can be read in one sitting. There are several odd occurrences within it, but it is not a ghost story which harks to conventions of the genre. Of de Kretser’s authorial decisions, Andrew Wilson writes: ‘… [she] undermines our expectations by refusing to play by the rules… One reads Springtime not for its shock value – this tale is much more subtle than that – but for the way de Kretser explores the nature of ambiguity and for her deliciously unsettling descriptions.’ It is described in its blurb as ‘rare, beguiling and brilliant’, three words which would draw me to read almost any novel. I found Springtime rather an atmospheric read, with a strong sense of place. De Kretser manages to make a setting which many readers would think of as idyllic, into something with dark edges. It is told using rather short, unnamed chapters, which add to the sense of tension. I found the story absorbing from the outset, and found myself really caring about Frances, who felt like a realistic character. The crafting of the plot is tight, and it feels as though not a single sentence has been wasted. It is a revealing novella, which has a lot of depth to it, and is ultimately quite powerful. There is such attention to detail here, and I’m certain that Springtime is a story whose nuances I will be thinking about for months to come. Marie Sizun’s novella, Her Father’s Daughter, is the twentieth title on independent publisher Peirene Press’ list. Part of the Fairy Tale series, it is described as ‘a taut and subtle family drama’, and has been translated from its original French by Adriana Hunter. Her Father’s Daughter is Sizun’s debut work, written when she was 65, and first published in 2005. The novella was longlisted for the prestigious Prix Femina. The structure of Her Father’s Daughter, which uses short, unmarked chapters, works well. The prose, which is relatively spare, but poetic for the most part, makes the story a highly immersive one. Her Father’s Daughter is easy to read, but there is a brooding, unsettling feeling which infuses the whole. Sizun is entirely revealing about the complexities embedded in relationships. Powerful examinations of family are present throughout the novella, along with musings about what it really means to know someone. Even though her protagonist is so young, this is, essentially, a coming-of-age story, where very adult situations are interpreted through the eyes of a child, who has no choice but to learn a great deal about her family, and about herself. Sizun is a searingly perceptive author, who demonstrates such understanding of her young protagonist. Her Father’s Daughter is an incredibly human novella, which has been masterfully crafted; it is difficult, in many ways, to believe that it is a debut work, so polished does it feel. The novella is well situated historically, and is highly thought-provoking. 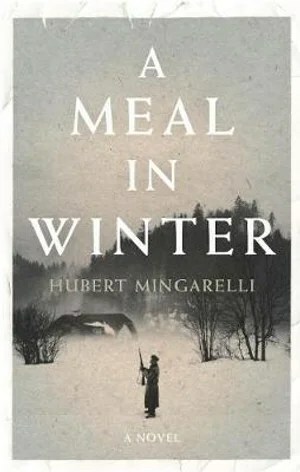 Hubert Mingarelli’s A Meal in Winter is heralded as ‘a miniature masterpiece’ in its blurb, and tells ‘the story of three soldiers who capture a Jewish prisoner and face a chilling choice.’ It was first published in France in 2012, and has been translated from its original French by Sam Taylor, recent translator of Laurent Binet’s excellent novel HHhH. It is Mingarelli’s first work to appear in English. A Meal in Winter is set during the Second World War in the depths of the Polish countryside. It begins in the following way: ‘They had rung the iron gong outside and it was still echoing, at first for real in the courtyard, and then, for a longer time, inside our heads’. The entirety of the novella is told from the first person perspective of an unnamed German narrator. Three soldiers, including the narrator, are sent out on a mission at dawn, ‘before the first shootings’. Their mission is to capture a Jew and take him back to their base, where he or she will be dealt with. The narrator’s fellow soldiers are named Bauer and Emmerich, the only two protagonists in the novella to have been given names. The entire novella has been split into quite short chapters, and is quite simple in its prose style, which contrasts rather chillingly at times with the futility which it presents. It is tinged throughout with memories from the pre-war past of the soldiers, as well as strange foreshadowings of the future. In the story, the soldiers find a tiny hidden dwelling in the countryside, spotting a ‘chimney which was barely raised above the ground’. A man emerges from the depths: ‘We didn’t see anything in his eyes either – no fear, no despair… All we could see of his face were his eyes… They were ringed with dirt and fatigue, but not enough to hide his youth. Despite the tiredness they showed, they still shone with life’. This man is referred to from this point onwards as ‘the Jew’. This, and other elements within the novella, are harrowing in terms of the impersonal way in which Jews were viewed by the German soldiers: ‘We were no longer allowed to kill them when we found them, unless an officer was present to vouch for the fact. These days, we had to bring them back’. The narrator goes on to say, ‘We’d only caught one, but he smelt bad enough for ten’. Whilst walking in the countryside with the Jew in tow, the men find a closed-up house and break in. They begin to burn the furniture in order to warm up and cook a meal – a soup which is savoured. Mingarelli’s setting has been developed well, and some of the scenes which he has crafted are incredibly vivid. It feels as though he has broken the constraints of the narrowed view that all German soldiers viewed Jews with scorn, and has included some shreds of compassion for the prisoner, however small. In this way, Mingarelli demonstrates both the good and evil which wartime situations can produce. A Meal in Winter is most interesting with respect to the ways in which the language barrier causes them to communicate using different methods. Mingarelli has crafted a novella which is very dark in places, and is quite unsettling in the foreboding which it builds. I consistently enjoy Sarah Moss’ novels, and was so excited when I found out about the 2018 release of her novella, Ghost Wall. The premise, which revolves around a seventeen-year-old girl named Silvie, who is spending her summer at an Iron Age reenactment with her strict father and put-upon mother, intrigued me, and I found myself absorbed in the story from the very beginning. It is difficult to pinpoint quite when this takes place, but a couple of clues given place it in the late 1980s or early 1990s. Silvie finds herself in the camp, which lies in a remote area of Northumberland, due to her bus driver father’s passion for history. They are living there for some time, along with Professor Jim Slade and three of his students, as ‘an exercise in experimental archaeology’. Silvie’s father is an ‘abusive man, obsessed with recreating the discomfort, brutality and harshness of Iron Age life. Behind and ahead of Silvie’s narrative is the story of a bog girl, a sacrifice, a woman killed by those closest to her’. The stories of Silvie and this unnamed ‘bog girl’ become linked in rather a horrifying way toward the end of the novella. I very much liked the opening of this story, which felt stylistically Moss-like from its first paragraph. The prologue begins with a series of quite choppy but very descriptive sentences, which immediately give one a feel for the darkness of the book: ‘They bring her out. Not blindfolded, but eyes widened to the last sky, the last light. The last cold bites her fingers and her face, the stones bruise her bare feet. There will be more stones, before the end.’ As with this example, Moss places small clues throughout for the reader to piece together. Silvie has depth and range to her character, and she is particularly believable for her flaws and naivety. When asked by one of the students whether she plans to go to University, her immediate response demonstrates the stifled, lonely life which she has lived thus far: ‘Stop questioning me, I thought, but I didn’t quite know how to ask anything of my own. How do you leave home, how do you get away, how do you not go back?’ As the novella goes on, Silvie lets the reader know small details of her upbringing. She talks, to herself at least, about her father’s psychological abuse in an eloquent manner, but the physical abuse is almost baldly stated. Of her mother, for instance, she says: ‘There was a new bruise on her arm’, before entirely changing the thread of her narrative. Ghost Wall has been impeccably researched and, to me, the story felt like rather an original one. I have never read anything quite like it before. The sense of foreboding is built wonderfully, and whilst quite different in some ways to Moss’ other books, it is sure to delight and chill her fans in equal measure. I published reviews of three of the Fairlight Moderns novellas recently, and having now read the last two in the series of five, thought that I would post reviews of these too. In Travelling in the Dark, Emma Timpany’s protagonist, Sarah, is travelling back to her native New Zealand from her home in England, accompanied by her young son. Her husband has recently left her, and she is making the journey in order to show her son where she spent her own childhood, and to meet an old friend with whom she has a lot of history. Travelling in the Dark begins in such a vivid manner, in prose which feels at once simplistic and engaging: ‘Sarah is on an aeroplane, crossing the night sky. Her hands are folded in her lap. Outside the window there is darkness. She could slide the small, white window blind down, close out the night, but somehow she cannot bring herself to make this one small act. The sense that she sometimes gets, that she must keep watching or she’ll miss something of importance, is intense, though she cannot see anything beyond the veil of ice crystals. No stars, no satellites. No planets. No moon. No radiant light from some far city.’ As one can tell from this snippet, Timpany’s descriptions are often quite lovely, particularly when she gives her attention to the natural world. Every other chapter, which is interspersed between details of Sarah’s present day journey, are vignettes set during her childhood. Such a sense of place and character can be found throughout Travelling in the Dark, and I so enjoyed Timpany’s writing that I am now waiting eagerly for her next publication. Bottled Goods is Sophie van Llewyn’s first piece of ‘long fiction’. This novella begins in the Communist Romania of the 1960s, where, in the first scene, protagonist Alina is taken on a roadtrip with her cousins and Aunt Theresa. Short chapters ensue, some of which are told using the voice of Alina, and others which use an omniscient narrator. A few chapters consist largely of lists. From the outset, Bottled Goods is vivid in its descriptions, and culturally and historically fascinating. Van Llewyn does incredibly well to put across the terror and strength of the regime in such a succinct yet harrowing manner. She demonstrates how quickly things escalated in the regime, and how far-reaching its effect was upon every Romanian citizen. The use of magical realism works very well too, particularly given the point at which it is introduced; it is used in quite a serious way, so does not tend to lighten the tone of the novella at all, but it does make one think. Van Llewyn’s blending of realism with the element of magical realism is rather inventive, and certainly makes for a strange, quirky, and memorable novella. A wonderful, and relatively new, publishing company has come to my attention of late, after publishing five interesting novellas set all over the world. I have read three of the currently published, and wonderfully designed, five to date, and thought that I would collect my reviews together here. ‘Eight year old Pepper sees the world a little differently from most people. There Are Things I Know is an intelligent, well-wrought novella, which deals with the abduction of a young boy, and is narrated from his perspective. The narrator, who goes by the nickname of Pepper, is naive at first, feeling trusting toward ‘Uncle Dan’, who calls himself a relative. As time goes on, however, he begins to learn that things are not as they seem, and that ‘Uncle Dan’ has nothing to do with his family. Pepper is an entirely believable character, with a lot of depth, who I felt so much empathy for. The tension which is built here is great, and I read it in one sitting, loath as I was to put it down. Sara Marchant’s core idea in her novella, The Driveway Has Two Sides, really intrigued me, and I couldn’t wait to read it. I enjoyed Marchant’s writing a lot; there were some really lovely turns of phrase here, and the characters felt utterly realistic. Whilst not a novella in which a great deal happens – it is largely about relationships and gardening, which do make for an interesting combination – I found it highly compelling. I am really enjoying these thoughtfully curated, and rather unusual, Fairlight Books novellas. I did not remind myself of the synopsis of this one before I began to read, and was rather surprised at times by the multilayered story which awaited me. Here, Ferner presents an intimate portrait of a husband and wife, and the ways in which their relationship has shifted since the beginning of their marriage. I found Inside the Bone Box incredibly well written, and wholly absorbing.